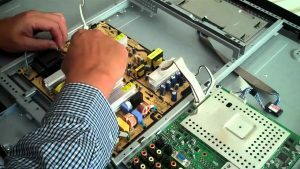 UK TV Repair specialise in television repairs Birmingham. When your television turns faulty UK TV Repair are the ones to call. No matter what make your television may be UK TV Repair can repair it. Based in Acocks Green, Birmingham our engineers can either pick your faulty television up from your home or alternately you can drop the device to our repair shop. UK TV Repair offer a quality, fast, reliable and affordable television repairs service. TV channels refuse to change and there is only one channel available to watch. A ‘Black Box’ imprinted on the screen. TV is stuck in ‘stand by’ mode. TV has horizontal/ vertical lines on screen disrupting the image. TV won’t start up at all. We repair all LED, LCD, Plasma TV repairs, SMART televisions and OLED. We do not charge for a call out fee. We do not charge by the hour. One fixed price to repair your television. Get in touch with UK TV Repair on 0121 371 0011 in order for you to be booked in for a home visit. The home visit will include diagnosing the issue you are experiencing with your television and fixing it on site. Engineers carry parts for all TV repairs in order for us to fix the issue on site, if we cannot fix the problem on site then we will take the television to our repair shop and repair it there. We can assure you your television will be more than in safe hands. For television repairs Birmingham call UK TV Repair now.